Board Game Basics – A Closer Look at Dice Games — GamingWithSwag.com - Dads By Day, Gamers By Night. When I say the phrase “dice games” what do you think of? Is it Yahtzee? What about Craps or some other seedy back ally gambling game? Maybe you just think of complete randomness. Whatever you may be thinking, it's pretty obvious that “dice game” doesn't really conjure up any good images, but if you think that there are no good dice games out there, you'd be mistaken. Today I'm here to talk about a few of my favorite dice games. For purposes of this article I'll be including any games where rolling dice is the primary driver of the game. A lot of games have large amounts of die rolling but I wouldn't exactly call them dice games. Miniature games are the best example of this, since they are largely dice driven, but dice are not the main focus. 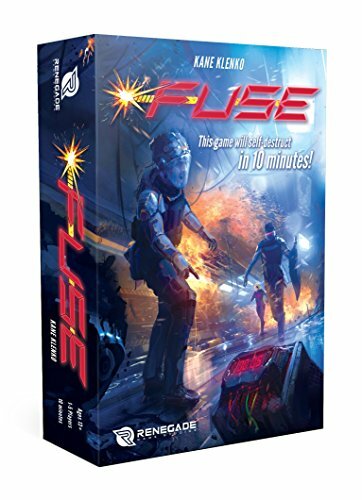 What is it: Played in ten minutes of real time fast paced action, Fuse is an exciting game of bomb defusal. All the players are part of a bomb squad working together to clear out bombs, represented by cards, within a ten minute time period. Each turn the active player rolls a die for each player and players then must each assign a die to one of their cards, which all require various combinations of colors and numbers, sometime in a certain order. If you cant assign a die all players have to lose a die from one of their cards. Once all cards in the deck are cleared, the players win. If the timer runs out with any cards left, the players lose. Why I love it: Fuse is quick to play and very addictive. Almost every time I've played, everyone has wanted to play again immediately, especially if we lost. The timer gives the game a sense of real urgency as well as keeping an alpha player from taking over the game. Even though the dice give the game a certain level of randomness, there's still a lot of decision making when deciding who gets what die and what bomb cards to take after you defuse one. 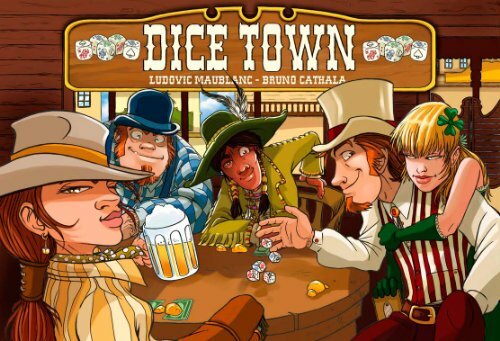 What is it: In Dice Town, players are old west desperadoes trying to gain more prestige then their rivals. Each player has 5 die with sides matching card suits 9 through Ace. At the start of each turn everyone rolls their dice and chooses one to keep (or more if they pay for them), then they simultaneously reveal them. Once all dice have been rolled everyone gets rewards based who has the most of each suit, with the best poker hand winning one to three properties. Those properties award points at the end of the game with the highest point holder winning. Why I love it: For a game that's this easy to teach and is mostly rolling dice, it's got a surprising amount of strategy. Going all-in on the best poker hand gets you the most points, but maybe you need money so you have more control over how many die you keep. What if you are winning a lot of poker hands but another player keeps getting the most Queens which lets them steal your best cards? Maybe one player is just ignoring the best hands and going for 9's to steal all the gold and end the game early? There's a lot of important decisions going on here! What is it: These two games are so similar that I just combined them into one entry. If you've ever wanted to play Yahtzee with giant monsters added then play one of these. Each player takes turns rolling die getting two re-rolls for a many or as few dice as they choose. Once they've kept all their die, they damage other monsters, give them points, heal them, or give them energy to buy upgrades, all based on which die are showing. You win if you kill all the other monsters or get to 20 points first. Why I love it: Giant monster Yahtzee! NEED I SAY MORE?!? Ok, I guess I should say more. This game is not only a lot of fun but it's also a great game to introduce people into the world of gaming. In fact I included it on my very first list that I did for the site for just that reason. 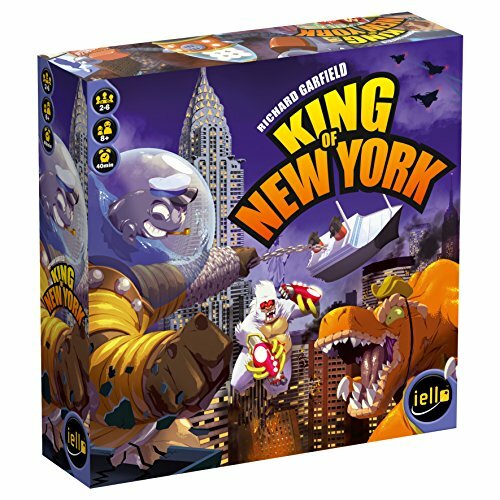 While both these games are pretty simple, the upgrades add to the replay-ability and King of New York has a few more mechanics to give it additional depth. 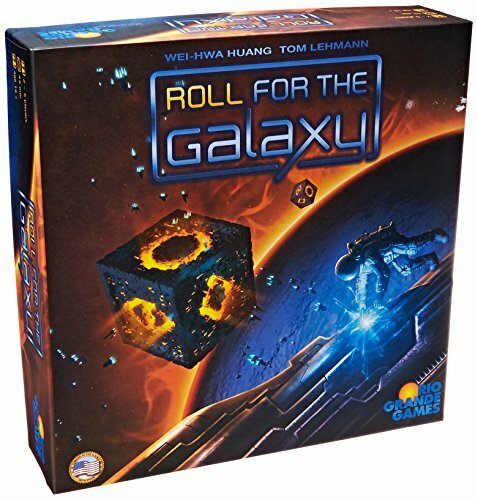 What is it: Roll for the Galaxy is a die based re-implementation of the hit card game, Race for the Galaxy. In this one, the players all roll die secretly behind a screen and then choose to assign them to various actions based on their sides with one die acting as as a wild that can be assigned to any action. Players then reveal their dice and get to perform every action that a player put their wild on as long as they assigned dice to it. The actions allow players to build worlds which give them points, more die, and special powers. When someone builds their 12th world or all the victory point chips are gone, the game ends and the high score wins. Why I love it: While it's easily the heaviest game on the list, it's also my favorite by a wide margin. I love that you have to try and foresee what other players will pick as their wild action to get the most from your own dice. Sometimes you gamble big and completely lose out. There is also a lot of variety in the world tiles so that no two games play quite the same way. This one's not as quick as others on the list, but for a game with this much depth it plays at a pretty brisk pace. 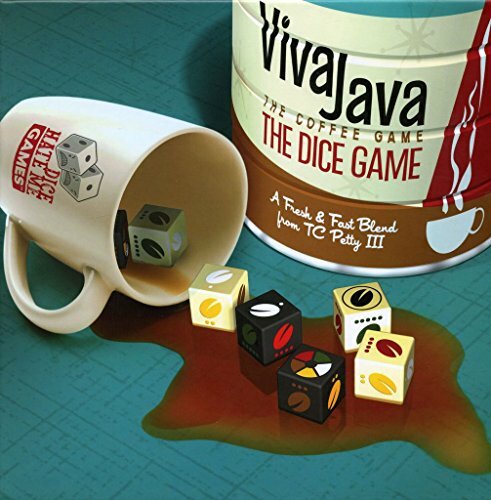 What is it: This one is a re-implementation of the fantastic, but unfortunately mostly overlooked, VivaJava: The Coffee Game. In it players take turns rolling five die and then either making a new coffee blend or researching new abilities. To blend you need to roll multiples of the same color and if there is no one currently claiming the blend slate or if you roll better than what is there, you take it for yourself, gain a point and get three more each turn you start with the blend in your control. To research you just choose any color of the die you rolled and increase the corresponding research field by that many points, gaining abilities when you hit certain thresholds. First player to 21 points wins. Why I love it: First off who doesn't love coffee? It's funny because coffee making is such a weird theme for a game but this game really drips with flavor (pun fully intended). In addition to looking great, it's got some great simple push-your-luck elements and the different variable research abilities also give the game a lot of variety. Also even though there's only one person reading this who cares, it's got a solo mode! Kingsburg: A medium-weight kingdom building game that totally blew me away the first time I played it. Unfortunately, it doesn't hold up as well on repeat plays. I still bought the app and play it on my phone though. Dragon Dice: Old school game originally from TSR (the company that made Dungeons and Dragons). 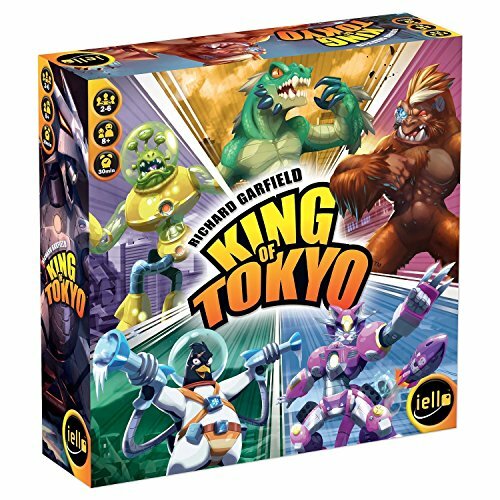 I feel like this game has faded away due partly to very fiddly rules and partly to a lack of stellar management from the company that currently owns the rights. Still fun though and it does a nice job of giving you the feel of large scale fantasy battles using nothing but dice.